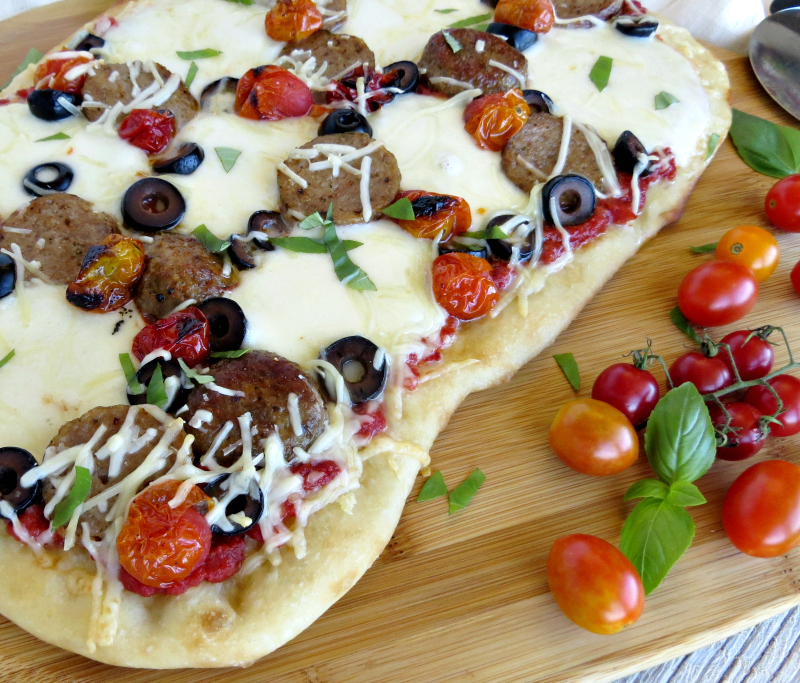 You’ll only need a few ingredients for this easy meatball pizza recipe. 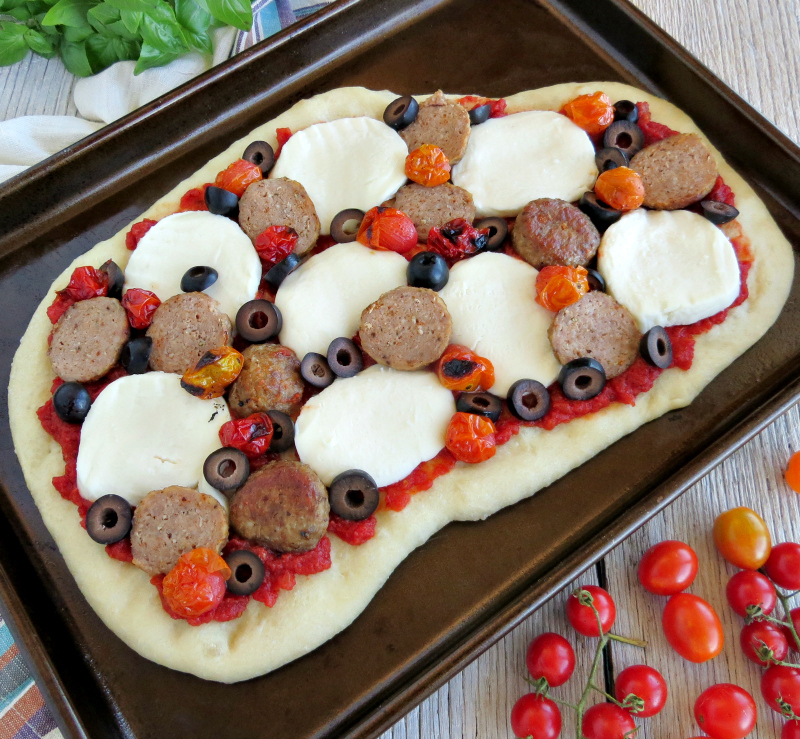 It’s perfect for a quick weeknight meal or served up at your next game day party! This is a sponsored post written by me on behalf of Carando®. All opinions are 100% mine. I think I can officially say that fall has hit Nashville! We’ve been waking up to cooler temps, and I’ve noticed leaves starting to fall on my walks. I love everything about Fall. The weather, changing leaves, boots, sweaters, pumpkins, and the FOOD! No one in my house wants a hot, heavy meal when it’s 90 degrees outside, so this is the time of year that we crave comfort food. And when it comes to comfort food, nothing hits the spot for me more than pasta and pizza! We started a tradition of making homemade pizza every Sunday a couple of years ago, and it has become something we look forward to all week. Shannon makes the crust, and I get to top it however I want. Having a husband that bakes is pretty awesome y’all! You can find their Italian sausage and meatball products in the fresh meat section of your local Kroger store. Mine were right near the other fresh sausage. While you’re in Kroger, be sure to check out the Taste of Italy event, which starts on September 17th and runs through September 24th. The event focuses on authentic Italian flavors and meal preparation. They’ll also have in-store demos and sampling events! Be sure to check for dates and times at your store. You can also go to the website for recipes, coupons, sweepstakes and other information about Italy. 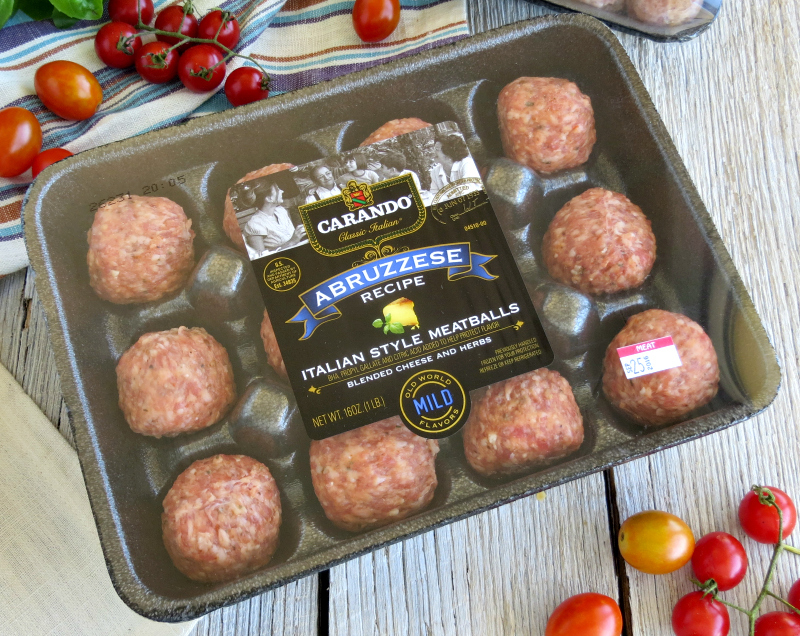 For today’s recipe, I picked up the Abruzzese Italian Meatballs, which are blended with pork, Italian cheeses, and herbs. These meatballs were on point ya’ll! The flavors were big and bold, and perfect for my pizza! I prefer to keep my pizza ingredients to a minimum, so the only other things I added were roasted heirloom tomatoes, olives, cheese, and basil. Keep it simple, and your flavors will shine. I used roasted tomatoes for this, because I’m obsessed with them, but you can add them fresh or leave them off altogether. Roasting them adds another layer of flavor, and really brings out their sweetness. You’ll also get a hint of smokiness from the little bits charred skin – delicious! 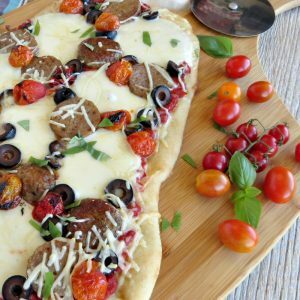 I like to combine hearty, savory flavors with pops of freshness, and that’s exactly what this pizza delivered. 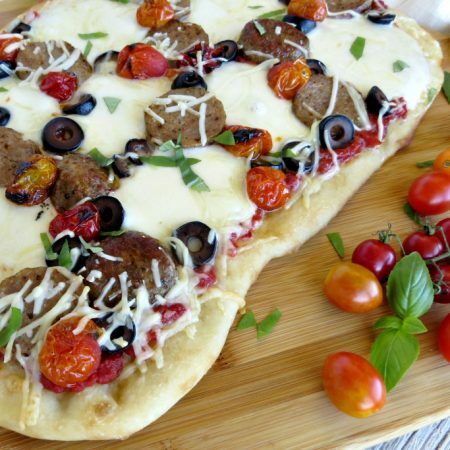 The crust was chewy and lightly crispy around the edges, the meatballs and cheese were rich and savory, and the basil added a fresh, herbaceous flavor that was the perfect finishing touch! Start by cooking your meatballs. Carando makes this easy by having the directions right on the package. I chose to bake mine, which gave me a pocket of time to get everything else prepped. When they are done, just remove them from the oven and set aside to cool. Adjust the oven temperature to cook bake your crust. 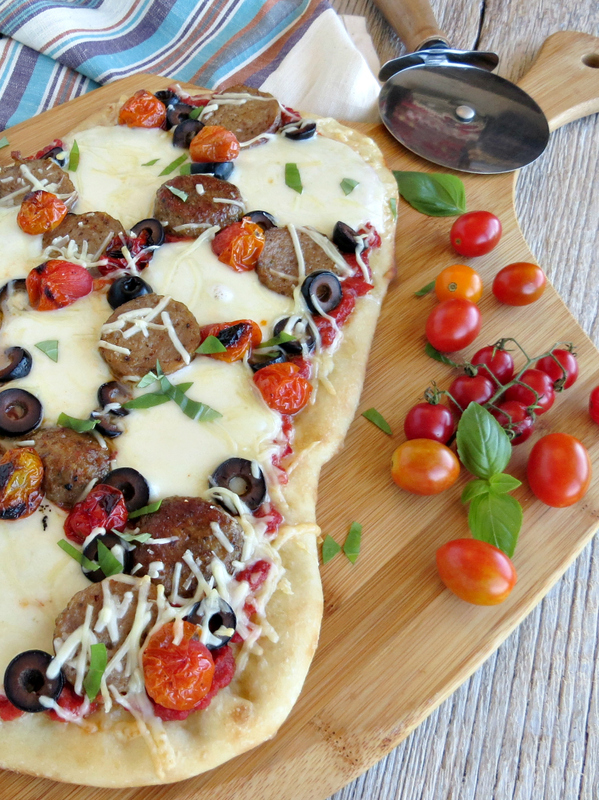 Next, you’ll want to roll out your dough (skip this step if using pre-cooked crust). When Shannon isn’t here to make it for me, I run to my favorite Italian restaurant and but it raw, which is a great tip for ya’ll. Buying your dough this way is always better. Always! And it’s usually very affordable. If using raw dough, I suggest pre-baking it for 3 to 5 minutes, depending on how thick you like your crust. 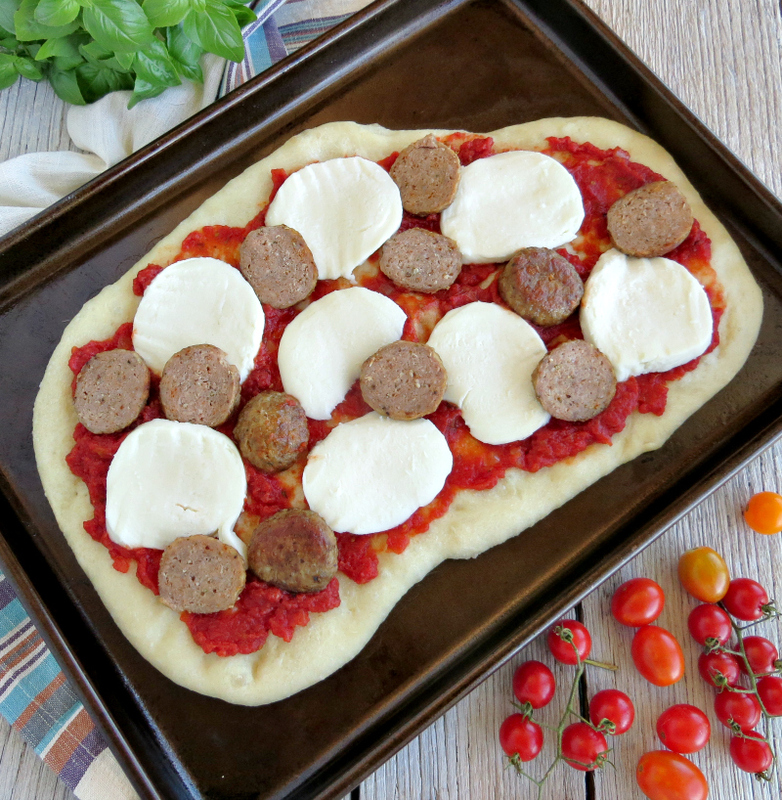 Since the meatballs are going to be fully cooked, the pizza won’t be in the oven long, and this prevents the crust from getting too brown. Once the crust is baked, remove it from the oven, and set it aside. To roast your tomatoes, turn the oven up to broil, and move the top rack all the way to the top. Toss the tomatoes with a little olive oil and a pinch of salt and pepper. Line a small baking pan with foil that you’ve crinkled up. This helps them from rolling around. Pour the tomatoes onto the foil and place the pan in the oven. Broil for 4-5 minutes, shaking the pan around every minute or so. watch them closely. When the tomatoes have popped and are lightly charred, remove them from the oven and set them aside to cool. You can totally skip this step and just add them raw, but roasting them really brings out their sweetness and adds another layer of flavor. To assemble the pizza, spread a little marinara on the bottom, and then top it with the cheese. 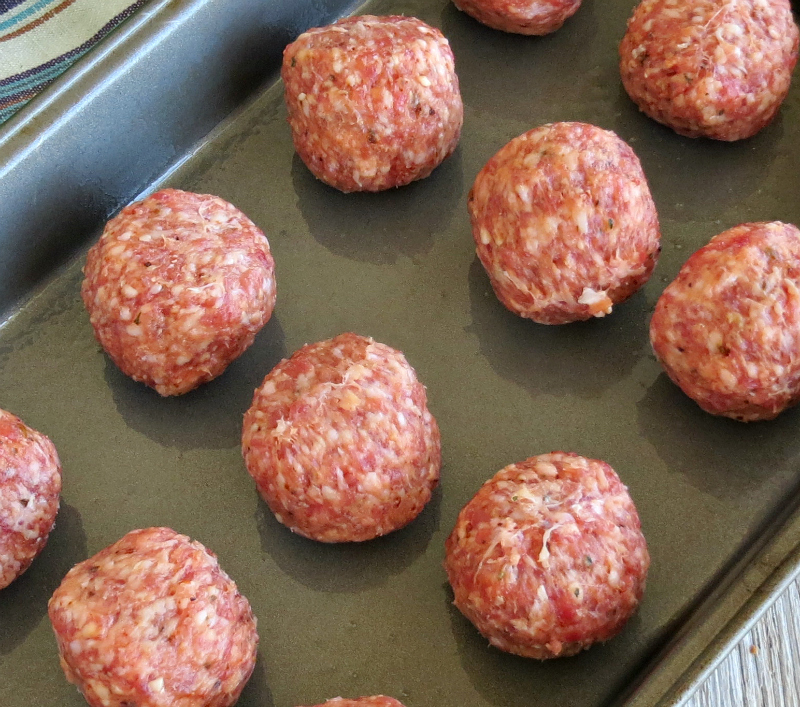 Slice your meatballs into rounds, and arrange them on top. You can use as many as you want. I used 5 meatballs for one medium-size pizza. Next, add the olives and roasted tomatoes. Again, however many you want. Bake for 4 – 5 minutes or until the cheese is melted and the crust is lightly browned around the edges. Give it a good sprinkling of fresh basil just before serving! Enjoy! What are your favorite Italian meals? I’d love to know! Cook the meatballs according to the directions on the package and set aside to cool. Carefully place the dough on the prepared pan, and partially it for 3 - 5 minutes. Spread the marinara in a thin layer over the dough. 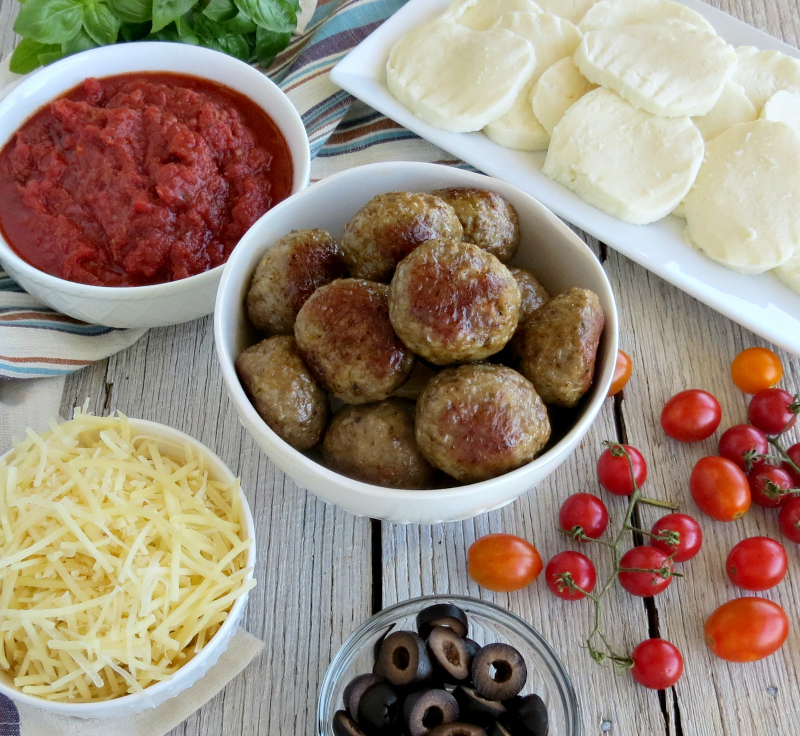 Arrange the mozzarella on top of the marinara followed by the sliced meatballs, olives, and tomatoes. Sprinkle half of the Parmesan over the top. Bake for 3 - 5 minutes or until the cheese is melted and the crust is lightly browned around the edges. Remove from the oven and allow to cool for 2 - 3 minutes. Cut the pizza into serving size pieces and sprinkle with fresh basil and additional Parmesan just before serving. If you prefer a thin crust, which bakes very quickly, you can skip partially baking it.